Live from Cadogan Hall in London, percussionist Evelyn Glennie and pianist Philip Smith perform their own composition as well as music by Keiko Abe, Betram Wee and John Psathas. Petroc Trelawny presents this year's Proms Chamber Music concerts live from Cadogan Hall. 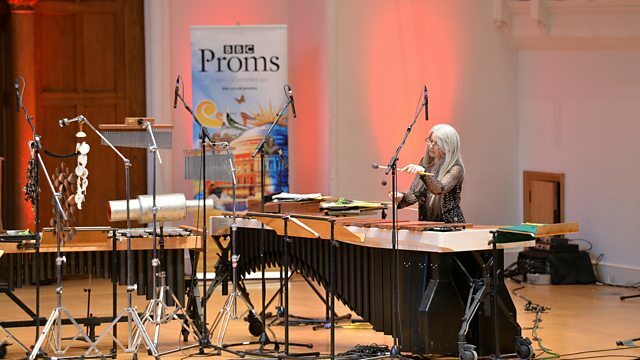 Returning to the Proms for the first time since 2007, award-winning Scottish percussionist Evelyn Glennie celebrates her 50th birthday with a musical party. She performs alongside pianist Philip Smith, showcasing not only her expressive virtuosity and versatility in works by John Psathas and Keiko Abe, but also her skill as a composer, in Orologeria aureola, a joint composition for Halo (metallic 'handpan') and tape. The performance also features a world premiere for Aluphone - an instrument invented only in 2011 and introduced at the 2012 Olympics opening ceremony by Glennie herself. [This prom will be repeated on Sunday 16th August at 1pm].